“All these years later, I still have that contemporary jazz bug in me, and love doing extended soloing, like Carton and Ritenour always have done even on their pop-oriented projects. I think I’ve grown as a composer and my songs have become deeper and more interesting and intricate over time." Patrick opens The Window To The Left expanding his areal of sounds before he lets his guitar shines. His crisp cords contrasts perfectly to the retro synth and the synth vocals. Tower of Soul, Yandall's first hit single mixes energetic guitar lines with vintage organ to a stunning brew. Back to nature with the tropical breeze La Jolla. Caribbean steal pans perfectly fit to the lyrical acoustic guitar with Spanish flavor. 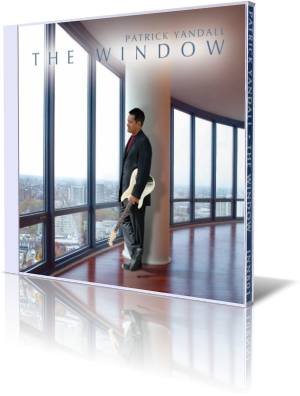 The Window conjures a reverie of Pat Metheny with the typical Roland guitar synths GR20 and GR300. On Jersey Shore Patrick integrates his guitar performance with cool vibes serving the soundtrack for your next coastal drive. Patrick Yandall shares the sympathy for the fate-torn island Haiti. Hope for Haiti is his contribution expressing all his sentiments with his emotional guitar. When you search after a sultry and hooking melody, then the romantic ballade You And I is my first suggestion. The interaction of guitar and flute is just superb. City By the Bay is Patrick's ode to his longtime home of San Diego. Accurately he remarks It's On Me. When Patrick lets his guitar sing, the sun shines bright. Margueritas at Sunset is a piece of Southern moody feeling of being alive. With rhythmical guitar decoration Patrick takes the organ in the lead. On Lifelines he combines the great scale of synth sounds, but when he returns like on The Last Time to his guitar he definetely sounds more authentic. The guitar is and stays his instrument. The Window is our connection to the outside world. It is also the opening to our inner side. Foremost The Window is Patrick Yandall's musical signal, where he stands today.